Trevor Anthony Prescod is a Barbadian politican and a current Cabinet Minister. He is a graduate of the Barbados Academy, Barbados Community College, and the University of the West Indies. An accomplished social historian and a paralegal, Trevor is also a Justice of the Peace and President of the Caribbean Movement for Peace and Integration. Currently director of the Israel Lovell Foundation spearheading the organisation's community development and outreach programme. Prescod is a former first Vice-President of the National Democratic Party (NDP). 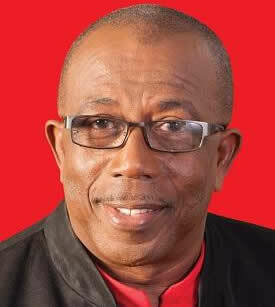 He first contested the St. Michael East seat for the NDP in the 1994 general election, but Democratic Labour Party (DLP) candidate, Joseph Tudor won that contest. In the 1999 general election, Prescod turned the tables on Tudor, this time running under a BLP banner. Prescod, was appointed to the Ministry of Social Transformation in an advisory capacity in 1999. In the Cabinet reshuffle of February 2006 he was appointed Minister of Social Transformation. He retained his seat in the 2003 election. Prescod first entered the Parliament of Barbados in 1986 as a DLP Senator, and served for five years. He later parted ways with the DLP and joined the NDP. He resigned from the NDP in 1997 and joined the ranks of the BLP. After a 2008 election defeat, Trevor was re-elected to the Barbados House of Assembly in the 21 February 2013 General Election. Prescod retained his seat in the 24 May 2018 election and was appointed Minister of Environment and National Beautification in the Mia Mottley Administration. Trevor Anthony Prescod, a resident of Tichbourne, Howells Cross Road is the father of three. An Anglican, Trevor also enjoys dance, theatre, and film and is a supporter of the Marcus Garvey movement.